I like to think the word “snob” doesn’t apply to me at all, but I’ve come to accept that I’m a snob about at least two things in life: coffee and lakes. I have no defense for the first snobbery—I just like my coffee extra strong, dark, and fresh, and if it’s not that way, I won’t drink it. No matter how sleepy I am. I’m not sure how I got this way about coffee. Being a lake snob, though, is a direct result of my Michigan childhood. I didn’t decide to be this way. I just grew up in a state that primed me to expect certain things from lakes. For starters, true lakes are naturally formed and have fresh water sources, they’re not designed and dug by the Army Corps of Engineers. I also expect lakes to have sandy bottoms and sandy beaches made of pure, extra fine sand that’s the result of wind and waves, not coarse mined sand and rocks transported to the site in dump trucks. And I expect lakes to be encircled by forests, not corn fields. That I don’t much care for lakes in Illinois goes without saying. I’ve tried swimming in two (not counting the Illinois side of Lake Michigan, which has the word “Michigan” in its name and is altogether different). Both were a bit too warm to possibly be clean and fresh; indeed, they left a slimy film on my skin when I came out of the water. Their rocky lake bottoms hurt my feet, while the slime on the rocks left me unsteady. Not even being able to even see the bottom through the muck is unnerving. Once out of the water, the so-called sand is useless for sifting through your fingers, much less building castles. 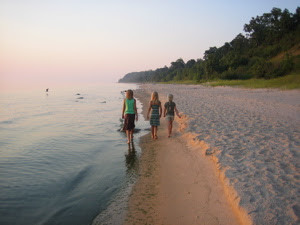 I can’t be without lakes in my life, though, so each summer we take the girls to a cottage on Lake Michigan for a week. They had a wonderful time again this year, doing all the things kids love to do at the beach: jumping waves, swimming out to the sandbar, building castles, digging holes in the sand until they reached water. There is also a small, rocky stream that runs into the lake just up the beach from our cottage, and the girls (who dubbed the magical place “Fairytopia”) spent hours playing there, building dams and redirecting the water in their butterfly-filled, imaginative world. There were several other kids staying at cottages near us, too, which was mostly fun. I say mostly, because although a couple of the families were kind people with good kids (all three of our daughters absolutely love their one new friend, M, in particular), another couple of families who were there for the week were another story. Here are examples of two extremes: One of the moms, who I talked to a bit, had this unnerving way of wanting to know everything about us—not because she was genuinely interested in us, but because she saw us as interesting specimens, and it would give her something to tell her friends later. I’m sure she was particularly amused as she sat lounging from her chair on the beach as I waded and splashed around, helping my girls try to catch fish in the shallow water (it was a hopeless effort). One of the other sets of parents did not speak to us the entire week, even though we played in the sand and water with their kids (while the parents sat on beach chairs nearby). On one occasion, their daughter joined my girls and their sweet friend M for a rather involved craft on the lawn, with all materials and supervision supplied by me. When her dad pulled up next to us in his expensive SUV, he called for her to get in the car, without a word to me. Like I was someone’s nanny or something! When we noticed his daughter had forgotten her towel, we called out to them. I approached the car with the towel as the dad, on his cell phone, looked straight ahead, holding his arm out the window for the towel. I threw it in his general direction (a little too well-directed, unfortunately). This whole aspect of our otherwise idyllic cottage vacation was like a hovering, dark, ominous cloud all week, not quite blocking out the sun but hanging around like it might. 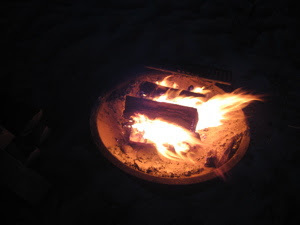 The last couple of days at the lake, I made a concerted effort to not let these people bother me, focusing instead on our family fun and on being friendly with M’s family, who we decided to invite to a bonfire on the beach our last night there. As it turned out, everyone thought they were having a bonfire that last night and inviting the various people they wanted to, so we all ended up at the fire pit. Including the suspiciously curious mom and the dad who treated me like someone’s hired help. I put on a really good attitude, handing out our entire stock of marshmallows, chocolate and graham crackers to the crowd. I was beginning to feel like we were in the midst of something very poetic—a coming together of different types who all had the same general goal: giving their kids a happy, memorable week at the beach. If our week-long vacation was a movie, this would qualify as the happy ending. Then someone’s kid greedily reached his hand in for a whole fist-full of marshmallows, even though other kids were waiting. Another boy, who had enjoyed meddling in the girls’ work at Fairytopia all week, had fun torching one of our nice, carved birch roasting sticks until it was a burnt stub. The rude dad refused to ask me for marshmallows, but instead had his son get some for him; every time the kid wanted more, he declared his intention by coming up behind me and poking me with his roasting stick. His four-year-old sister, when I was saying something generic to my girls about our bonfire rules, looked up at me with her hands on her hips and said, “It doesn’t matter because it’s MY bonfire!” Sigh. It’s true: Kids will be kids and pretty much everyone has a portion of snobbery hiding (or not hiding) somewhere within. That’s where this whole story began, right? All I can say, though, is that turning my girls into lake snobs—otherwise kind people who happen to prefer fresh, clear, natural lakes—is a much lesser evil than raising them to be snob-snobs.